As we work through the letters, we are concentrating on letter identification and phonics. This week we are back to letters at tot school this week after our back-to-school theme break! This week we have been working on the letter R, and so far Henry has enjoyed our letter R tot school theme. 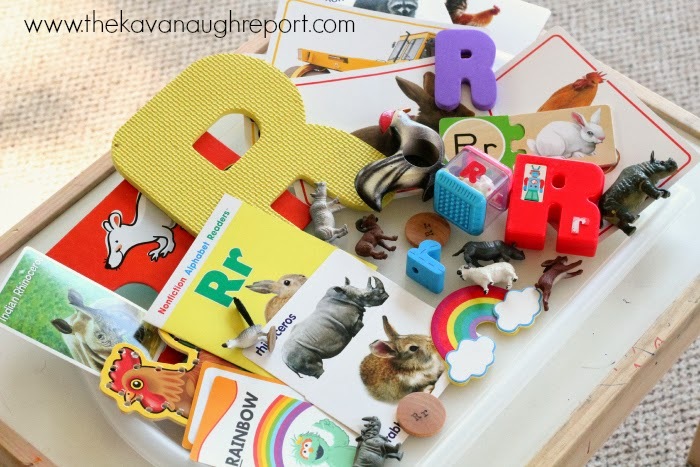 Prior to this week Henry could identify the letters R and r.
Henry is 30 months old. On our first tray this week was a rock cleaning and polishing tray. 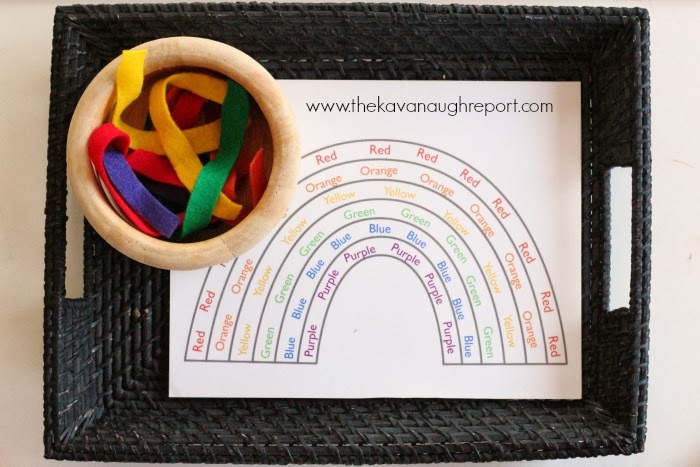 This was by far the most popular tray with the kids that come to our Montessori inspired co-op. However, Henry hasn't been super into it. 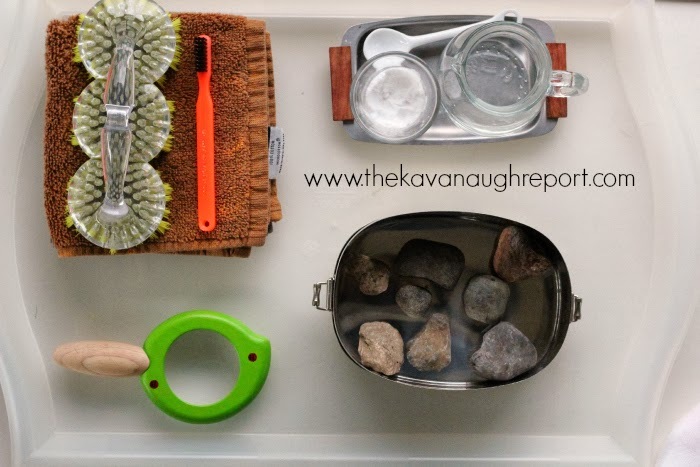 On the tray, are several rocks that I grabbed from my yard, a small pitcher of water, some baking soda with glass spoon, a couple brushes, a magnifying glass, and some towels. 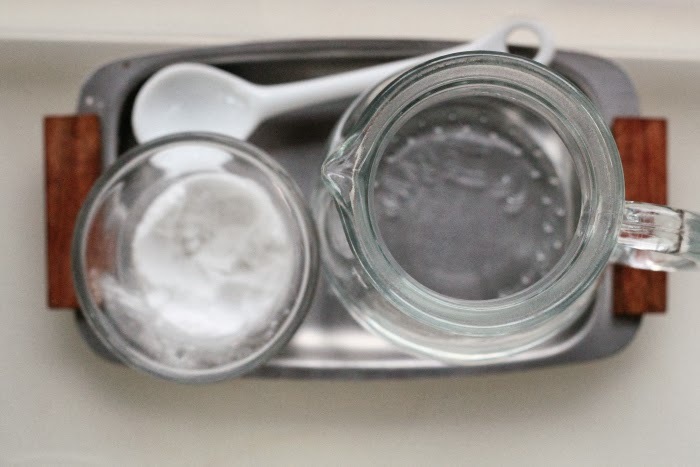 The kids were able to do everything on their own -- from pouring the water to scooping baking soda and scrubbing. I totally expected this tray to create a huge mess during the co-op, but the kids did so great and not one drop of water was spilled! 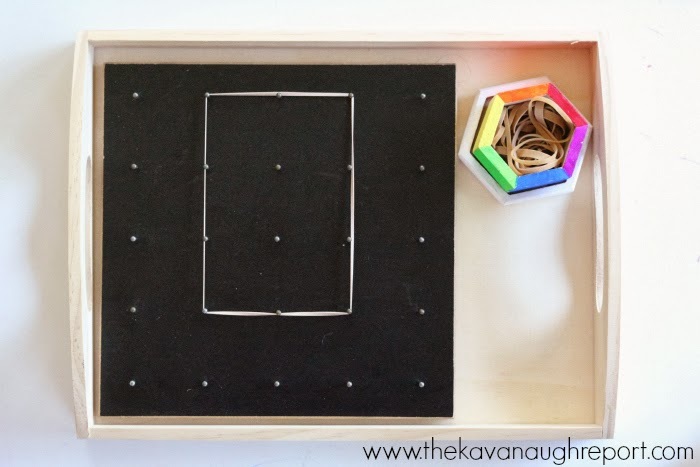 On the second tray was a geoboard, and a small rainbow container filled with rubber bands. Henry could use the rubber bands to make rectangles or any shape he wanted. Henry, and the other co-op children, were interested in this, but mostly lacked the strength in their hands to make anything meaningful. But, it was still good fine motor practice that kept Henry's attention. 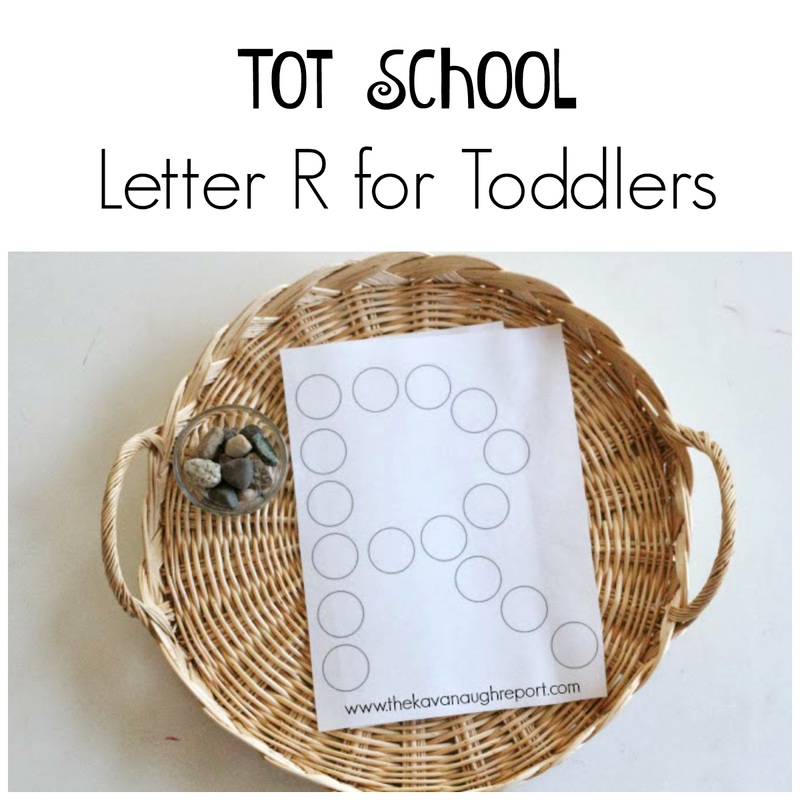 The final tray was two dot sheets making the letters R and r. The tray included a small glass container filled with rocks. 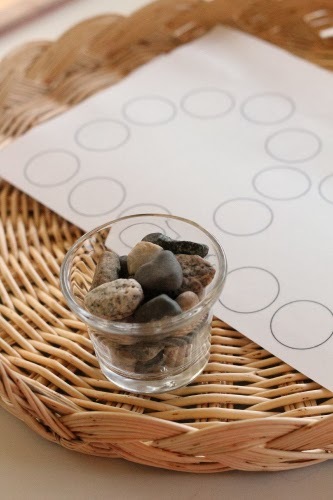 Henry could then make the letters using the rocks. He has shown zero interest in this. 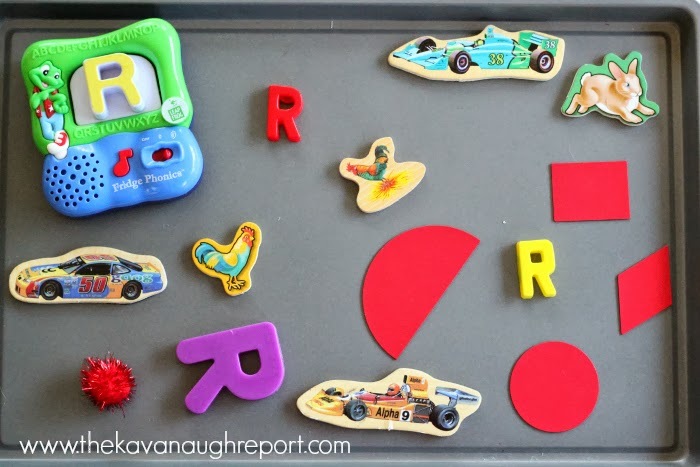 Letter R Sensory Bin: So far Henry hasn't played with it. And none of the kids showed interest during the co-op. Felt Rainbow: Henry hasn't seen this in over a year, and actually liked it a lot more this time. He and several of the kids attempted it, although it still requires more fine motor skill then they have. 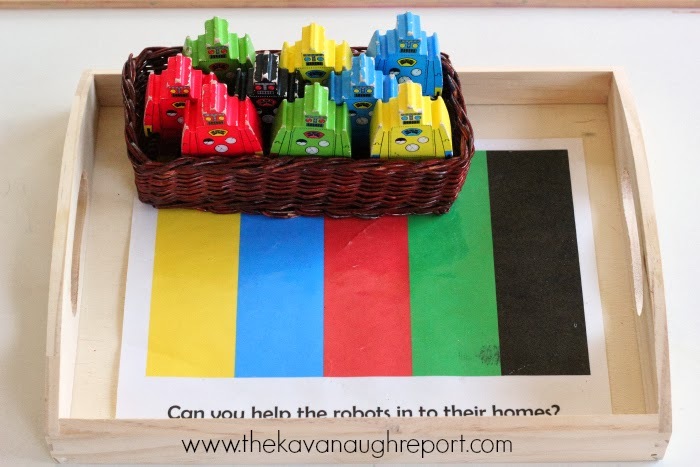 Match the Robots: Henry actually plays with this tray, and the wooden robots quite a bit. They are always a hit with him, and were enjoyed by the co-op kids. 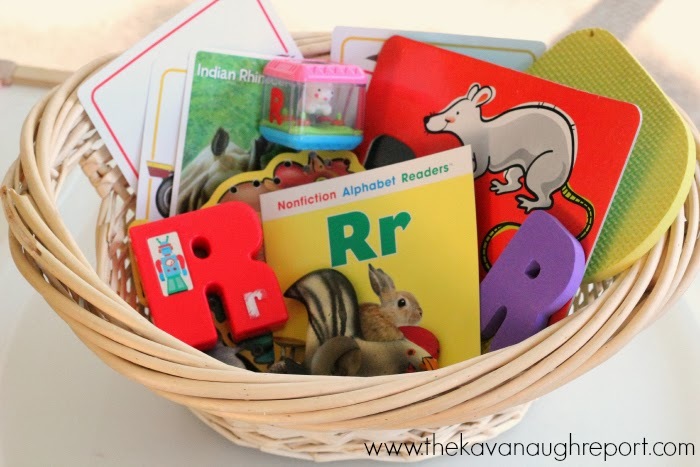 How have you explored the letter R? 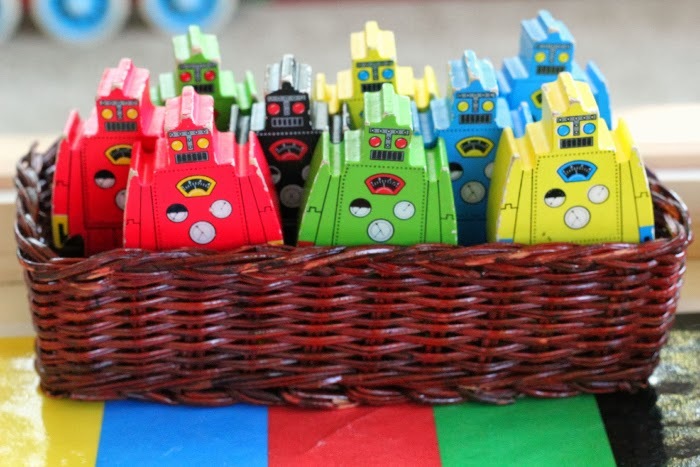 These trays all look so fun. I especially love that rock polishing one. 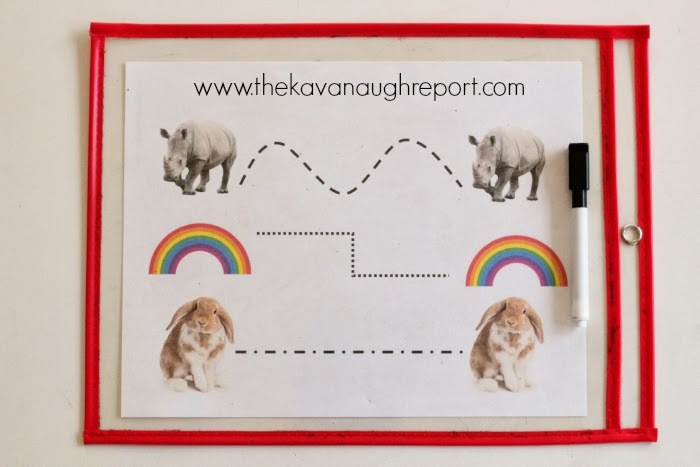 I'll have to pull that out when I do R activities with my toddler. WOW! These are incredible, truly. I have shared and pinned. 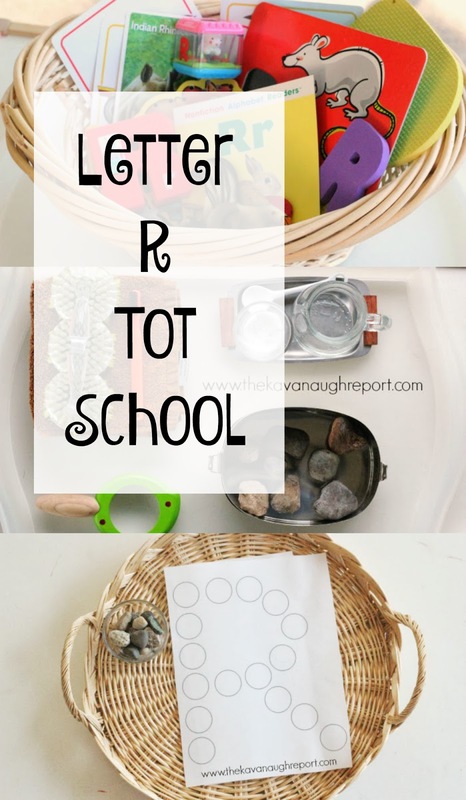 I'm going to add these to my to-do-with-the-little-ones list! I do like the rock polishing, and think it's amazing that the kids do so well with it! My little inquisitive curious george of a boy would probably spend a lot of time 'experimenting' to see how far the water would slide if he poured it on to the table... :) I think he might like something similar to the rocks and letters pages, however, so I am going to catalog this one to be sure and draw some ideas from later on! Great post! I seriously though there would be a lot of dumping of the water, but one demonstration on how to use the tray and no one did it. And there were three very active curious little boys using the tray!